Tony has been showing and handling horses since he was fast enough to keep up with a lengthened trot. 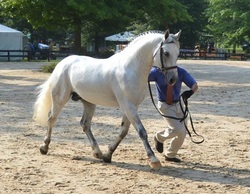 From foals and young stock to mature horses, his goal is to present your horse to best advantage for the judge. Tony shows both pure and partbred stock. ​Owners and championships too numerous to name. Tony & Sarah have prepared and presented dozens of horses for the inspection process to include pure and part breds as well as stallions, geldings and mares. ​More than the moments spent in the ring, producing is the art of enhancing and highlighting the natural attributes of each horse. Full list of successful gradings are too numerous to list. We usually have at least one youngster for sale as well as in utero contracts available. We accept horses on consignment under strict terms and can agent for buyers or sellers. We have experience with international purchases and can help make the process not only run smoothly but be FUN! We have experience with both pure and partbred irish draughts as well as other types of sporthorses. We have prepared horses for amateur and professional homes, eventers, dressage horses, fox hunters, etc. Our emphasis is on confidence building through correct flat work and stimulating work over fences both in and out of the arena.